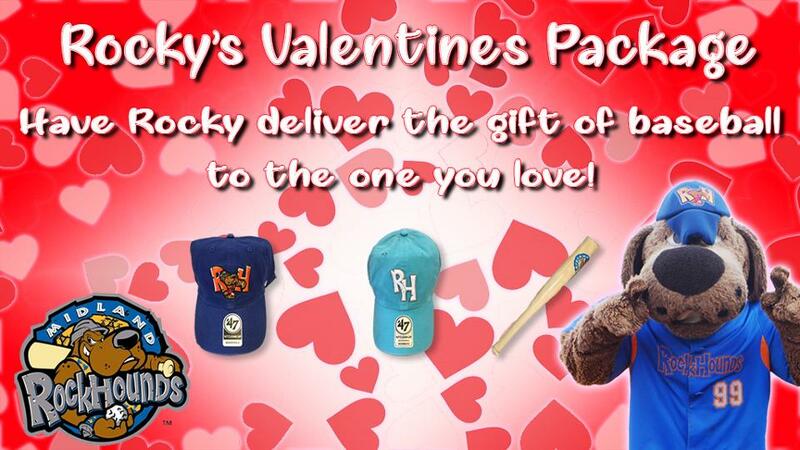 Surprise your Valentine with a special delivery from Rocky! On Valentine's Day, Rocky will be making 30 deliveries around the Midland/Odessa area. You can choose from one of our three packages available. For men, you can purchase a package that will include four vouchers redeemable for any game in 2019, a RockHounds home hat and a box of chocolates. The women's package includes four vouchers redeemable for any game in 2019, a RockHounds Carribean Blue hat, and a box of chocolates. You can even order our kids package that will include four vouchers redeemable for any game in 2019, a souvenir bat and chocolates delivered by Rocky to their school! All of our Valentine's packages are $50, but we are only selling 30 of them, so be sure to place your order early! The deadline for ordering is February 10. For more information or to purchase, please call (432) 520-2255. Order forms can be downloaded here as well and brought to our offices at Security Bank Ballpark during our business hours of Monday-Friday between 8:00 a.m.-5:00 p.m.